FILE - Russian human rights activist Lyudmila Alexeyeva speaks at a news conference in Moscow, Sept. 27, 2012. Lyudmila Alexeyeva, a human rights pioneer and dissident who challenged the Soviet and Russian regimes for decades, demanding that they free political prisoners and establish democratic rights, died Saturday in a Moscow hospital, a Russian official said. She was 91. 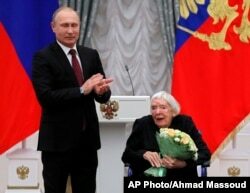 FILE - Russian President Vladimir Putin congratulates the Moscow Helsinki Group Chair and human rights activist Lyudmila Alexeyeva, during a ceremony to present the 2017 State Awards for Outstanding Achievements in Human Rights and and Charity Work in the Kremlin in Moscow, Russia, Dec. 18, 2017. "I won't live to see Russia become a democratic state with the rule of law,'' she told the AP. "He agreed, the camps existed for two years after that and the people lived in camps rather than under bombs,'' she said. 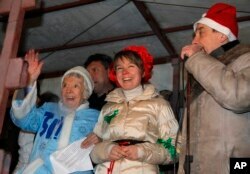 Russian human rights activist Lyudmila Alexeyeva, dressed as Snegurochka, Russian Snow Maiden, left, environmental activist Yevgenia Chirikova, center, and prominent rights activist Lev Ponomaryov speak during a rally in central Moscow, Dec. 31, 2010. Many liberal Russians have blamed the country's leaders for steering Russia toward authoritarianism. But Alexeyeva said Russia's problem wasn't its leaders — it was its weak society, which she said was incapable of holding leaders to account. "I don't think the leaders of Western democracies are really such strong democrats,'' she said, but added that Western leaders have to support human rights and the rule of law or risk being voted out. "I told him we all get them,'' she said, her eyes misting.